And here is the official website explaining this audacious day of the week. 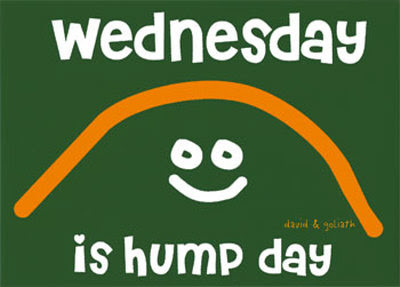 "Wednesday is often referred to as "hump day" because of its position as the middle day of the work week. If the work week were a hill, then Wednesday would be the crest. It is all down hill from there. (Whether the down hill ride is a coast or a descent into a swamp is left to the individual.)" The absolute BEST day of the week, the day of maximum hope that maybe, you might make it out of this week alive. A particularly good hump day can last you the rest of the week, and by Doomday morning (Monday) you survive by anticipating hump day. Nothing goes wrong on hump day"
Thus wishing you a great weekend..